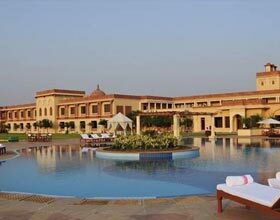 Address: Circuit House Rd, Jodhpur, Rajasthan 342006 India. Famed as the newest among the existing palaces of the India, Umaid Bhawan Palace Jodhpur is a classic specimen of modern day Edwardian architecture. 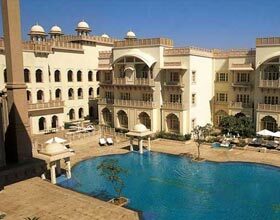 Constructed in 1943, this sumptuous palace resort was built to portray the modern Jodhpur swapping with the magnificent Mehrangarh fort. Cradled in the blue city, Umaid Bhawan is accredited among the lavish residence palaces in the world. A realm of immaculate services, intricate inlay work, cordial conviviality, scenic lush lawns and marvelous flooring, this heritage palace hotel spread in the area of 28 acres is specimen of opulence living. Grand banquets and sparkling green lawns accompanied with dedicated flawless catering makes Umaid Bhawan Palace and ideal host for luxe destination weddings, gala receptions, and glamorous product launches. An indulgence complimented with royalty, the signature Jiva Spa at Umaid Bhawan Palace is a resuscitating nirvana. Along with reenergizing wellness treatments, resplendent indoor and alfresco swimming pools with deck chairs, customized Jacuzzi and healthy yoga sessions enchants the grandeur of this luxurious Taj hotel. Each accommodation at Umaid Bhawan Palace is a paradise with unblemished fusion of modern day comforts with yesteryear culture. Broadly classified into Palace Rooms, Historical Suites, Royal Suites, Grand Royal Suites, Maharaja Suite and Maharani Suite; all guest rooms are an essence of regal lifestyle of the Marwar. Smoothening the eyes of the guests lodged are the lively colors of the furnishings, miniature paintings on the wall, and quintessential landscape vistas. Quenching the guests palate is the scrumptious array of cuisines and eclectic beverages at various venues of Umaid Bhawan Palace, Jodhpur. 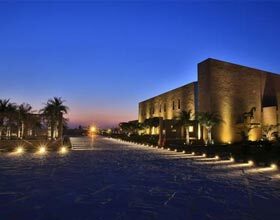 Risala, a multi-culinary delight with bent of Indian and Continental savors offers splendid views of the Mehrangarh fort, verdant gardens and the Sun City. Boasting of its marvel interiors including portraits of the royal legends, this exquisite restaurant offers a classic collection of 210 wines from around the world to its patrons. Pillars, an all day caf� nested in the peristyle patio serves refreshing beverages and delectable snacks. Adore the scintillating sunset or gaze the gorgeous Edwardian style architecture of this grandiose heritage property. The Trophy Bar, as the name says is a lounge bar with breathtaking interiors singing sagas of the adventurous hunting voyages of the royal family. The Sunset Pavilion is a fascinating idea of the visionary Maharaja Umaid Singh to enjoy the dinner amidst the tranquil ambience and dazzling moon light. This roof top restaurant exalts of its lip smacking grills and barbeque fares from India and around the globe.